I suppose my first reaction, when I originally encountered Alexander de Cadenet’s series of Skull Portraits, recently on show at the Andipa Gallery in London, was to quote these quite famous lines by T.S. Eliot to myself. The memento mori has a long tradition in both Western art and Western literature. The fascinated contemplation of death is, in particular, one of the major subjects of English literature of the Jacobean period as Eliot himself suggests, citing Webster in the first line of the quatrain quoted above. In the third verse of the same poem, he cites John Donne. Other cultures, very remote from our own, also had a penchant for representation of skulls, or ‘death’s heads’ as they are commonly called in this context. Examples can be found in Aztec art (though the famous rock crystal skull in the collection of the British Museum is now known to be a fake). The recently discovered Neolithic Hongshan culture in China also seems to have produced sculptures of skulls in crystal, and also in other hard materials such jade or obsidian. Here, too, however, there has been much suspicion of fakery, to the point where opinion has skittered off into wild speculation – some ‘experts’ on the subject now believe that the Hongshan skulls are transmitting devices made by extraterrestrials. Alexander de Cadenet has always been an extraordinarily inventive artist, who eagerly embraces both bold new ideas and new technological means. The series of Skull Portraits offers a combination of the two. 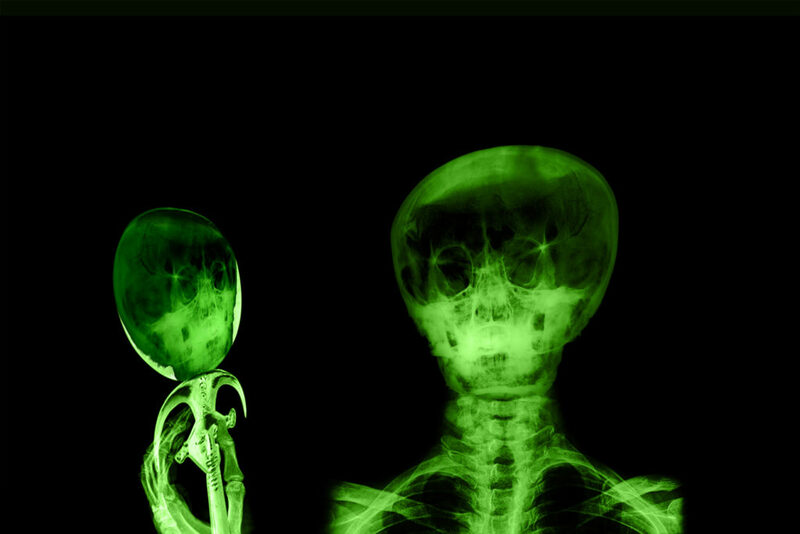 The basic material for some of the x-ray images is the product of diligent archival research; subjects include Marilyn Monroe, Adolf Hitler, the Ancient Egyptian Pharaoh Tutankhamen and Albert Einstein. 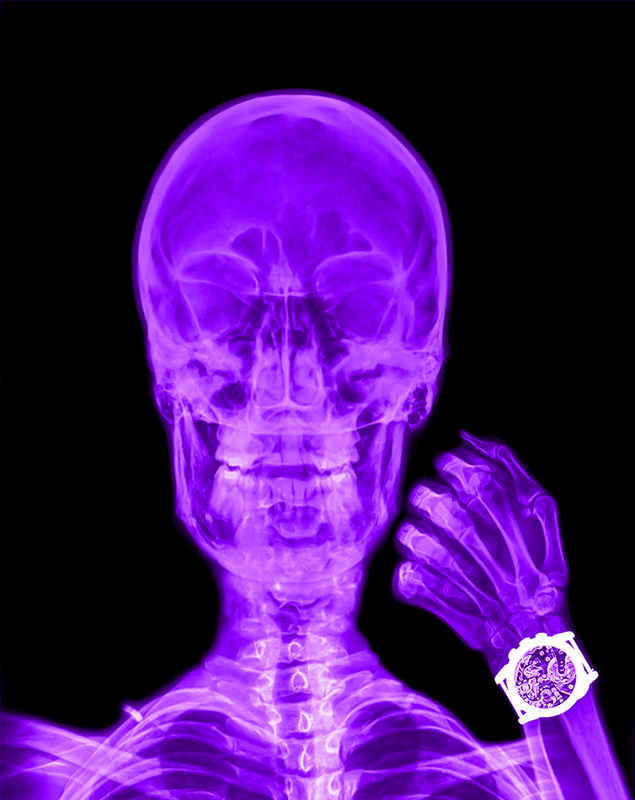 Others are portraits of people the artist knows, using x-ray images specially made for the purpose. 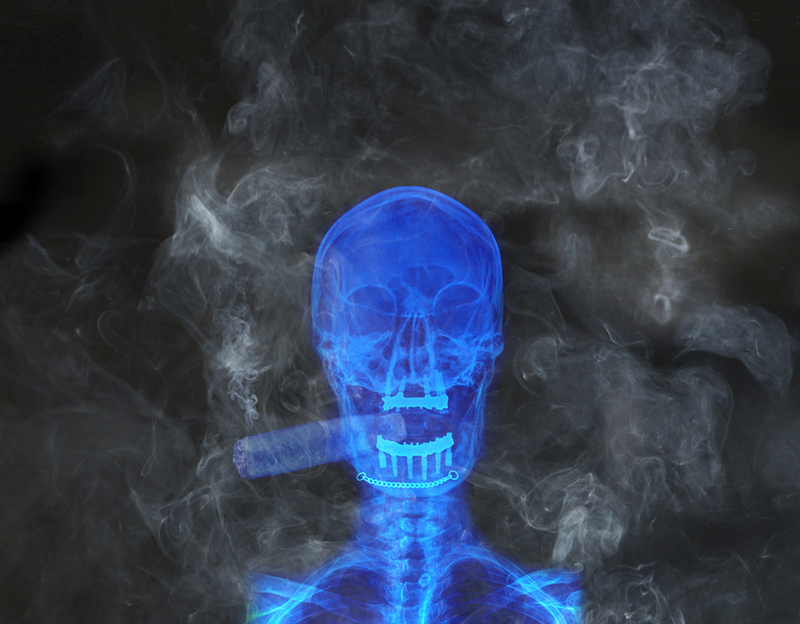 In all cases, because of the nature of the x-ray technique, they are as life-like – some might say as death-like – as anyone could desire. Human beings can and do alter their outward appearance in a multitude of different ways – make-up, elaborate coiffures, beards and moustaches, tattoos, piercings, botox injections, cosmetic surgery. With possible minor exceptions in the case of cosmetic surgery – a skilled surgeon can build you a less receding chin, using bone taken from elsewhere in your body – an x-ray will strip all these artifices away. When I attended Alex’s extremely buzzy and fashionable private view I was amused to note one or two conspicuous ‘trout pouts’ among the throng – ladies of a certain age whose lips had obviously been filled to bursting with added collagen. 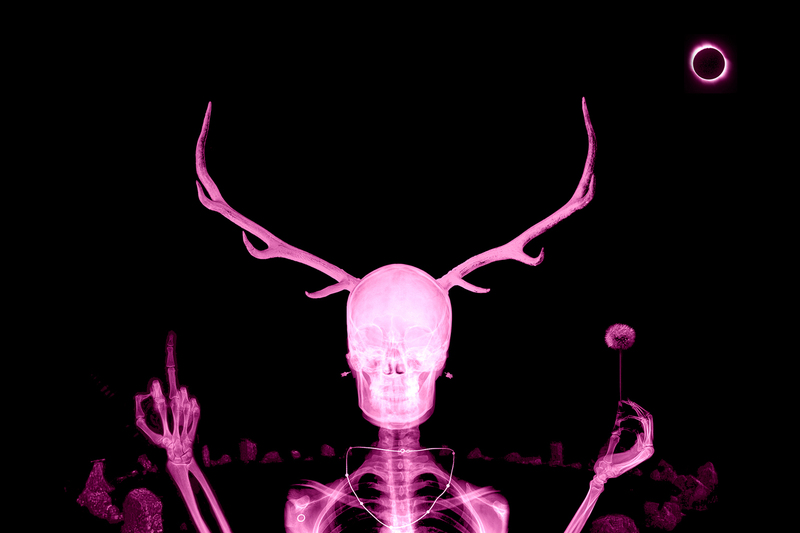 In a very specific way, an x-ray of your skull delivers the only truly real and unalterable you. The x-ray made from Tutankhamen’s mummy offers an indubitably exact portrait of this personage from more than three thousand years ago. It makes him, in a paradoxical sense, thanks to the wonders of modern technology, a contemporary of all the other people represented in the show. The actual x-rays, of course, are not simply things-in-themselves in this context. We are never allowed to forget the origins of a given image – but the images are also subtly manipulated – that, after all, is what artists do. They take reality, and turn it into something else. In this context, what I admire are the sitters who have deliberately subjected themselves to this process. Marilyn, Einstein and Adolf – not to mention King Tut – had no notion of where their x-rays might end up. However, de Cadenet also has sitters who voluntarily subject themselves to an x-ray machine, complete with various accessories – there is a man with a cigar, where the neck chain of his now invisible jacket floats eerily in front of his chin; another person- age, equipped with horns, and perhaps female (the clue is the wildly swing- ing earrings) is brandishing what seems to be a dandelion head. The title of this latter image, surely ironic, is The Trophy. After all, who sees a dandelion as a trophy?